Ufone’s vision is to engage the youth in activities which promote the image of Pakistan, keeping this in view, Ufone has collaborated with AIESEC in conducting project ‘Pakistan Tum He To Ho’ which is aimed to highlight the positive side of Pakistan in the international arena. AIESEC, the world’s largest student-run organization, is the international platform for young people to explore and develop their leadership potential to have a positive impact on society. Their platform enables organizations to interact and source high-potential university students and graduates from all over the world through our projects, exchange programs, conferences, and virtual communication tools. Pakistani youth feels the pressures associated with belonging to a country to which many negative stereotypes are attached. Project ‘Pakistan Tum He To Ho’ aims to fight such stereotypical thinking. AIESEC representatives from foreign countries are currently in Pakistan to conduct Ufone’s project ‘Pakistan Tum He To Ho’ and as part of the project they conducted a cultural diversity workshop for Ufone employees. It was a highly interactive session where the international interns discussed their perception of Pakistan before visiting and how their thought process had changed after spending a couple of months here. It also pointed out similarities and differences between different cultures and encouraged exchange programs which gave students an opportunity to visit different countries and learn about their culture and norms. 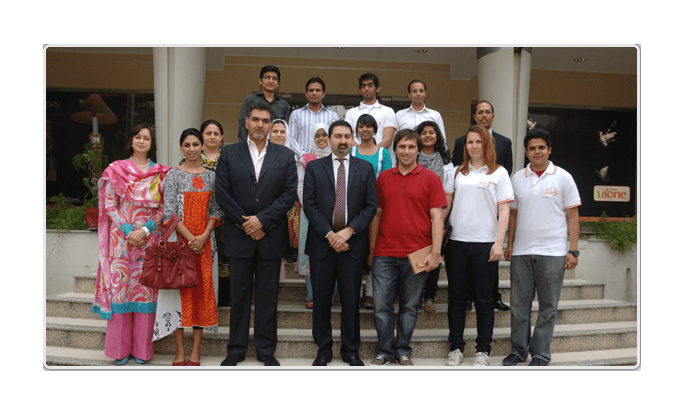 The interns also had a one on one session with Akbar Khan, chief Marketing Officer at Ufone and got some insight on the workings of Ufone as a competitive telecom company in a highly challenging market. This workshop was also an eye opener for Ufone employees as there were quite a few things which they realized that they take for granted but are very intriguing to a visitor from another country. All groundwork done by these interns will be shared with AIESEC members across the globe which will ensure that the Pakistan’s soft image is portrayed all around the world.